A few days ago I saw on Instagram that Windham was hosting this mini quilt challenge. I saw their post right after it was made so I was able to comment quickly and was chosen to participate. They sent me a package of fabric with the agreement that I would make an 18" square mini quilt for their quilt market booth. The most exciting thing was that I had no idea what fabric they were going to send me. I would be lying if I said that I wasn't hoping for the Far Far Away reprint, but when I opened the package I found prints from French Bull's collections African Surf and Mosaica. I was a little nervous because they sent a pretty limited amount of fabric so there was no room for mistakes and I couldn't really change my mind if I didn't like my first attempt. I ended up using my own striped chevrons tutorial but I changed the number of strips, the width and height, and the angle that I cut the strips, ha ha. I have a hard time doing the same thing the same way. Then I took a flower from 3 different colorways of the same print and appliquéd them onto the front of the quilt. I finished it off with the striped binding. Overall I am pretty happy with how it turned out. But I think the really exciting thing about participating in something like this is seeing what other people make, so I can't wait to see the Quilt Market photos of the Windham booth. It looks great! 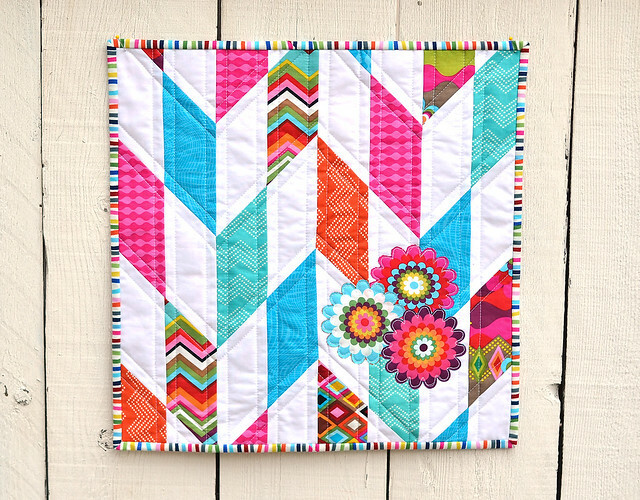 I love the flowers appliqued onto the chevron. it looks great -- i love the binding and how the flowers seem to pop off the quilt. I think you have a home run there! Very cute quilt. How fun! It turned out great, so much color and things to look at. Super cool Erica! And you only heard about this a few days ago??!! SO fast! Love it, what did you put on the back? I always think the back should be as cool as the front. OMG!! I LOVE this. The colors, the pattern you used, the flowers..it's all so nice together! Great job! Super cute and love the binding sripe too! That's lovely. But not what I think of as a mini. (Mini referring not to the finished size but the size of the pieces.) Good luck! Do you know which collection you'll request if you win? That is adorable! The applique flowers is such a great addition to your fantastic pattern! Nice work, it turned out super cute!